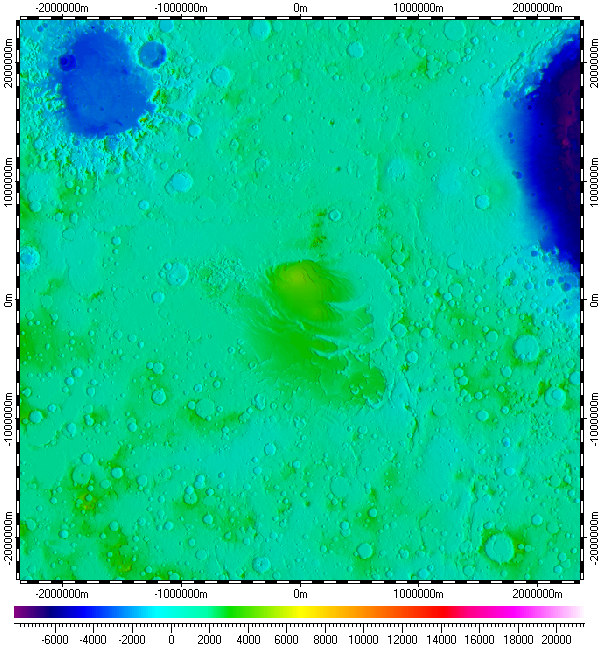 The datum of Digital Elevation Model of South Pole of Mars, included in the archive, derived from raster data of Mars Orbiter Laser Altimeter (MOLA) Mission Experiment, version 1, which was part of Mars Global Surveyor (MGS) mission, and distributed by Planetary Data System (PDS) of NASA. The elevation data is kind of topography over areoid. The datum has multiple resolutions, utilizing data resolution from 460m to 115m. The data uses Polar Stereographic Projection with true scale latitude of -90°. Also the datum contents sparse set of spatial regions covering main areographical features of South Pole of Mars and also representing limiting areas for each primary used data of respective resolutions. MarsSouthPole.zip - Size: 367,798,740 bytes (350 MB); MD5: EF7D3098965059FE51324B7358F28DC0.